I had this vision that after completing our 100-day pledge it would be difficult for us to indulge in any former rule-breaking foods. As it turns out…we didn’t have any trouble with it at all! And one of our first meals ended up breaking even more rules than we originally anticipated. Pictured is one of the delicious (if I do say so myself) tacos that we had the other night. My first thought was that we would be breaking the local meat rule with an all-natural ground turkey option from Earth Fare. I personally prefer the flavor of ground turkey over ground beef, and unfortunately I cannot find any local sources for ground turkey around here. As you can see our turkey taco mixture (which included bits of carrot and mushroom) as well as some other goodies (like cheese, bell peppers, tomatoes, avocado, and sour cream) were all wrapped up in a nice little crunchy taco shell. I was so focused on finding these shells that are made with masa flour (which is a whole grain corn flour) that it didn’t even occur to me to consider how the taco shells were made. So a few bites into our meal, I couldn’t help but notice the yummy crunchiness and said to my husband…are these deep-fried? The moral of our little dinner story is that if it looks like a chip, tastes like a chip, and crunches like a chip, then it is definitely a deep-fried chip!! So not only did we eat non-local meat, but we (sort of accidentally) ended up wrapping our meal in a big deep-fried chip! And I learned that if you deprive a child from eating chips for 3-months they might get really excited when you finally give them one. 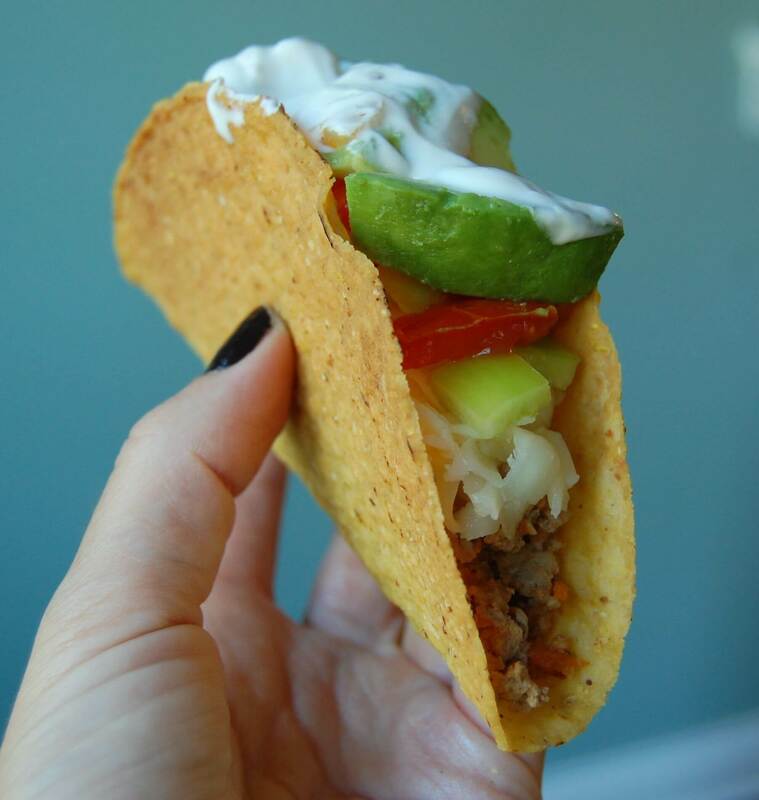 My 5-year-old just couldn’t stop telling us how much she loved the taco dinner and she even said “This is the best thing I’ve ever eaten!” We told her to enjoy it while she could because this was a special occasion, and we won’t be having these taco shells again for a long time. All of us actually enjoyed and savored every last bite, but my husband and I definitely felt like that was enough rule-breaking food to last us at least a week…moderation is key! And if that wasn’t enough for one evening we were then faced with a decision to let (or not let) our children eat a cupcake that was sent home from school with my 5-year-old. I was actually a little confused on the origin of the cupcake and how it ended up in her backpack in the first place. All I could figure is that it was from a birthday celebration a few days earlier, and I suppose since I wrote the teacher a note explaining that our pledge was over she thought she would send it home. 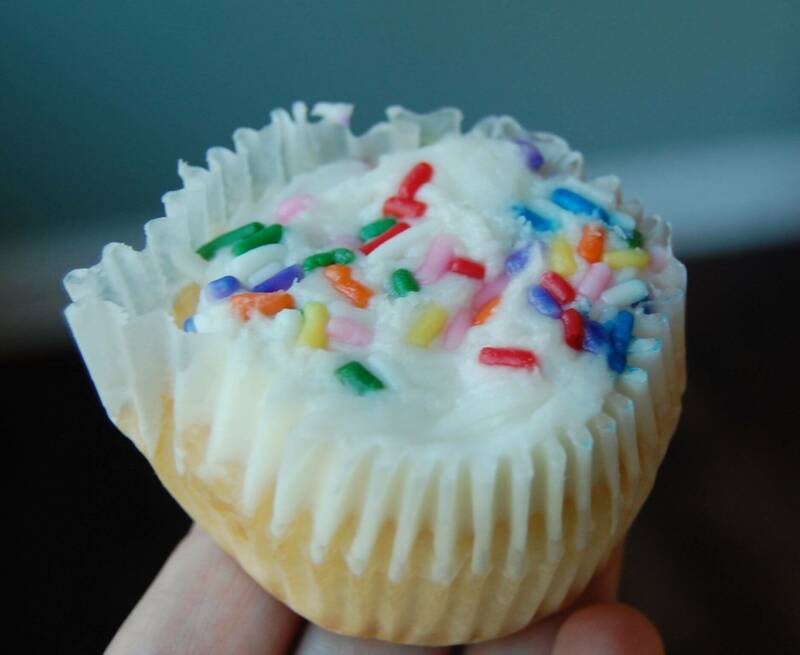 So what a way to dive right into some more rule-breaking foods…a 4-day-old cupcake made with unknown ingredients from an unknown source that my daughter already saw and WANTED! So after a lot of contemplation we let them each have one bite and then I threw the rest away. And oh did they want more, but that was all we could stand. Like I said earlier…the decision making part of all of this might turn out to be even harder than the 100-day pledge itself! Can you tell me where you got the tortilla shells from? Wondering what the ingredients are on them. The tacos look delicious!!! I got them from Trader Joe’s…I already threw away the box, but I think the ingredients were something like masa flour, lime, maybe salt, and 1 or 2 other things. They were good, but I think we will have to experiment with making homemade baked shells next time! What an awesome idea!!! I am amazed at all you are able to accomplish(all that cooking wow!) as well as share all you do with us.. thanks once again for letting us be a part. I have read other healthy food blogs, but #1 I love that you have children(i do also) #2 that you are local,because I have access to just about the same area items as your family #3 that you are very honest and realistic about your journey…#4 taking recipes and adapting them, sometimes its hard for me to think outside the box of food preparation and substitutions. Thanks again! I found the sausage recipe in my September issue of Everyday Food. It would help you stay on track b/c it contains maple syrup rather than sugar. Mix pork, sage, thyme, maple syrup, pinch nutmeg, 1/2 tsp. salt, and 1/2 tsp. pepper. Divide into 4 patties (3Tbs each). Heat oil over medium-high and cook until browned, 1 minute. Cover and cook until cooked through, 5-8 minutes. Hope they are as good as the local sausage you enjoyed! I am so excited to try baked taco shells!! What a good idea. We will have to try the sausage one too. I love getting recipes…thank you! I appreciate your site and have followed your posts for a long time. I’ve even tried many of your tasty recipes! But as an RN who works daily with those who suffer from eating disorders, I think you should rethink your word usage of “rule-breaking” foods and to rethink depriving your family of foods that you feel belong to that category. I see women and men struggle mentally and physically after years of abusing their bodies by having a distorted relationship with food. I’m a mother to a young daughter as well and although I try to show her what a healthful diet looks like, I do not deprive her of foods she wants to try at friends’ houses or school cafeteria. As long as we as a society can show how to balance foodand exercise with self-acceptance and love of our bodies, there will be no need to have “bad” food lists and hopefully spare those we love from these horrific diseases.